Social determinants of health a main focus of Mayo medical conference. ASU and Mayo's dynamic, decade-plus relationship continues to evolve. With government leaders still undecided on the subject of national health care and the fate of millions of Americans hanging in the balance, Mayo Clinic Center for Innovation held its annual Transform 2017 conference in late September at its headquarters in Rochester, Minnesota. Five Arizona State University students were selected to attend and be privy to a series of talks, debates and networking sessions with some of the world’s leading health-care professionals. ASU and Mayo Clinic have been working together for 12 years on programs that range from nursing to medical imaging to regenerative and rehabilitative medicine to wearable biosensors. Last fall, the duo formalized their relationship through the creation of Mayo Clinic and Arizona State University Alliance for Health Care, and earlier this summer, Mayo Clinic School of Medicine welcomed its first cohort of 50 students in Scottsdale. Students at the Scottsdale campus are guided by a jointly developed curriculum focused on the science of health care delivery, taught by both ASU and Mayo Clinic faculty. David Sklar, senior adviser and professor at ASU’s School for the Science of Health Care Delivery, also attended Transform 2017. An accomplished MD, Sklar came to ASU by way of the University of New Mexico, where he served as program director for the emergency medicine residency, chair of the emergency department, senior associate dean for clinical affairs and, most recently, associate dean for graduate medical education. Sklar is also the author or co-author of more than 150 articles in medical literature on topics such as medical error, quality improvement, medical education, international health, and literature and medicine, and he serves as editor-in-chief of Academic Medicine, the leading journal in medical education, sponsored by the Association of American Medical Colleges. “More and more [in health care], we’re bringing in knowledge from other related fields,” Sklar said to the students as they gathered for lunch one day during the conference. “Psychology, anthropology, bioengineering. Lots of different places. Read on to learn more about the students chosen to attend, what they think of ASU and Mayo’s approach to health care and health-care education, and what role they hope to play in it all. Daniel Nguyen always knew he wanted to help people for a living. So during high school, he signed up for an EMT program — and hated it. “That one line, that ‘Thank God you’re here,’ that made me go, this is worth it,” he said. They helped the girl to the hospital, where she eventually recovered, and Nguyen started his medical journey anew. As a freshman at ASU, he studies biomedical science and volunteers at the Student Health Outreach for Wellness clinic (SHOW), a tri-university, student-led initiative providing free health care and education for individuals experiencing homelessness in Phoenix. He found the conference and the overall spirit of Mayo Clinic to be very inspiring. Randall Arroyo comes from a law-enforcement family, with a father who has 30 years in the field. He figured it’s what he’d do too, until he volunteered in the emergency department of a hospital as a sophomore in high school. “I’ll never forget, my first day, we had a codeDoctors often use the term “code” to refer to a patient in cardiopulmonary arrest. within maybe the first 20 minutes that I was there,” he said. Arroyo was deeply affected by what he saw but was heartened at the sight of so many doctors and nurses coming together in what he called an “organized chaos” to do everything they could to help someone. That was the moment that put him on the path toward medicine. Nowadays, he’s a junior at ASU studying kinesiology and working as a scribe for emergency medicine doctors at Banner Estrella and Banner Desert Medical Center in Phoenix. He follows the doctors throughout their shifts, sitting in the room with the patients and observing the entire treatment process. Alicia Darwin had never heard of Transborder Chicana/o and Latina/o Studies before coming to ASU, but now the biochemistry senior is minoring in the subject. She wants to use what she learns to address minority health care and reduce health-care disparities. As a student at ASU, she was able to shadow an oncologist at the Mayo campus in Scottsdale. “Something I noticed [there] was that they did a really good job of that [a more holistic approach],” she said, recalling cancer patients who reported seeing dieticians and going to support groups in addition to their medical treatment. Darwin hopes to one day work at a Mayo facility herself. Julia Lorence was born and raised in Germany. Her first love was dance, and she received a degree in ballet and a minor in dance therapy. Then she suffered a stroke. She had complained of symptoms to her local doctors, but they always told her the same thing: There was nothing wrong. After her stroke, doctors at an overseas military hospital operated by the U.S. were able to treat her. Afterward, she decided to pursue medicine in America. Now a junior in biomedical sciences at ASU, Lorence is conducting research on brain tumors at the Mayo campus in Scottsdale and has become enamored with the medical facility and its unique approach to health care. Mayo Clinic, she feels, is diligent and so much more. Megan Feith is one of only six graduate students in the pediatric nursing specialty program at ASU’s College of Nursing and Health Innovation. Children’s health care has always been her passion. “I only do kids,” she said with a laugh. Feith also completed her bachelor’s in nursing at ASU, meaning she has spent a lot of time doing clinical work at various medical facilities in the Valley. University Sustainability Practices makes it easy to green your event and office during campus sustainability month. Event hosts and office staff may participate in the ASU Sustainability Certification Program to receive a bronze, silver or gold certificate. Green events are an easy way to be sustainable and engage attendees to become more aware of campus sustainability in the process. Beyond pairing recycling and landfill bins, food, transportation and education are areas to begin greening events. Event planners can use ASU’s Aramark catering services’ Decidedly Green Catering Menu, which includes vegan and vegetarian products that encourage attendees to eat low on the food chain. This menu is seasonal, plant-based and serves food from more than 15 local food producers, like eggs from Hickman’s Family Farms. Catered events serve American Humane Certified meat, cage-free eggs and Monterey Bay Seafood Watch certified seafood. Every certified event diverts or recycles environmentally friendly eating utensils. Hosts also can encourage guests to walk, bike and take public transit to the event. Attendees also may take the intercampus shuttle between the ASU campuses and Mayo Clinic. Request a presentation from a University Sustainability Practices team member or the Zero Waste department to learn more about sustainability operations at ASU. The campus culture of sustainability is apparent when Zero Waste department volunteers work at large university events. ASU’s annual staff barbecues are the largest zero waste event on campus each year. At the 2017 events, the diversion rate was 94.3 percent. Overall in the fiscal year 2016, ASU composted 508.09 tons and diverted 36.5 percent of all waste from the landfill. Also in the fiscal year 2016, University Sustainability Practices engaged 8,597 students, faculty and staff through 102 sustainability-related events. “Greening events made a positive impact on campus last year, and the ASU community has the opportunity to work together to continue our momentum this year,” said Mick Dalrymple, University Sustainability Practices director. "Campus sustainability month offers many opportunities for community members to start greening their events and join that momentum." Arizona State University’s Fresh and Local Market sells fresh, local and organic produce. ASU is a gold-level Bicycle Friendly University. During ASU’s Bike Month in October, Sun Devils are invited to attend campus bicycle registration events. ASU’s annual staff barbecues are the largest zero waste events on campus each year. Denis Hayes, founder of the Earth Day Network and president of the Bullitt Foundation, came to ASU this month to talk about how universities might help create better buildings. This month, ASU celebrated the opening of its Student Pavilion — the first net zero energy building at the university, meaning it uses no more energy than it creates. The Blue Bag program complements the university’s widespread blue bin commingled recycling program. Blue bags are available free of charge to offices and departments on all ASU campuses. With more than 14,000 employees, ASU faculty and staff have a chance to impact sustainable campus culture with its certification program for offices. The certification engages all aspects of the workplace, including printing, energy, purchasing, waste and creating a sustainable workplace community. A Canon Print Assessment is a simple way to start the office certification process. Assessments may include energy, toner and paper-saving recommendations. These small changes made a big impact in ASU offices. Double-sided printing saved 417,326 pages and 1,434,855 gallons of water in the fiscal year 2016. By completing Canon Print Assessments, ASU departments reduced its carbon footprint by 154,739 pounds and saved 1,688 trees in the fiscal year 2016. Reaching a gold-level office certification could be as simple as a commitment to turn off lights and monitors when not in use. Another option is to install motion-sensor lights, which turn off after a period of inactivity. When office equipment or other items are exhausted, send them to ASU Surplus Property, which diverts used ASU office items from the landfill. Some of the items for sale are often cheaper than buying new. 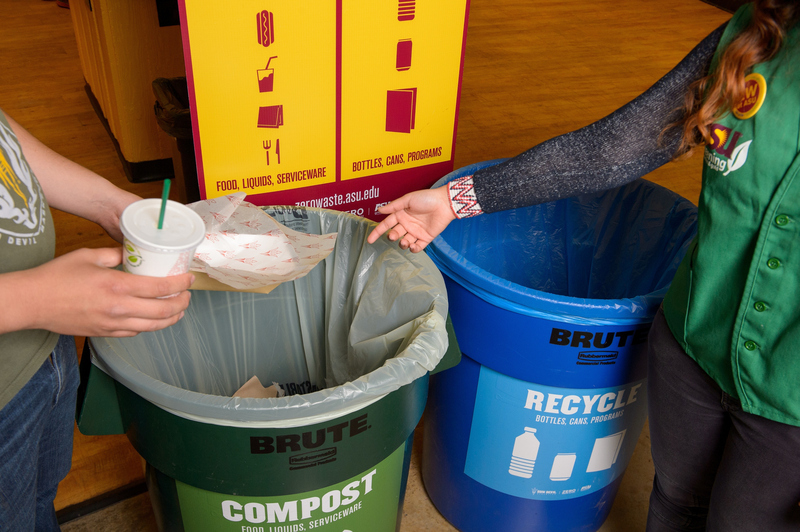 There are two ways to divert waste from the landfill and increase ASU’s zero waste reporting. Departments may request on-demand or scheduled pickups of lockable shredding containers for a small fee. The Zero Waste department also provides the Blue Bag program to divert hard-to-recycle items like plastic coffee pods and batteries. To become more involved with ASU’s sustainability culture, join the Green Devil Network, which includes training to become a sustainability advocate. Sustainable transportation efforts staff can make include carpooling or using the intercampus shuttle between campuses. Additionally, campus sustainability events like the Fresh and Local Market engage participants to consider sustainable practices. Event volunteer opportunities also are available for staff; email the Zero Waste department or search Zero Waste @ ASU on VolunteerMatch. University Sustainability Practices began offering the Sustainability Certification Program for events and offices in 2014 and 2010, respectively. Since then, more than 250 events and 40 offices have been certified. ASU staff who made individual improvements to their events and offices make ASU a leader in sustainable operations.